I’ll be the first to tell you I’m no fan of store-bought frozen meatballs. But they were buy-one-get-one-free at the grocery store (which I turn into buy one at half-price when I’m shopping unless I actually need two of whatever it is). And my stash of homemade frozen meatballs was gone so I picked some up. I was planning to just use them to make spaghetti and meatballs at some point during the week when I spied these whole wheat hoagie rolls in the bakery and had to have them. Like, seriously, I had to have them. They’d just been baked and the whole store smelled like homemade bread and I had. to. have. them. This lead to the idea of meatball subs which got me to wondering how things would go if I just loaded up the crock pot with spaghetti sauce, veggies and meatballs. Which is what I did. I wasn't sure how the veggies would finish up or if the meatballs could withstand cooking that long but I decided to try it out anyway and hope for the best. That’s the secret to becoming a good cook, I think. Being willing to take risks and not getting too upset when things don’t work out. I mean, there’s always peanut butter and jelly, right? Am I right or amiright? I will say I’m looking forward to making this again with homemade meatballs because the store-bought ones still aren't on my list of favorites but the concept is solid! I was able to assemble these easily when I got home from work and had no trouble weeding through the peppers and onions to make subs without for my onions who didn't want the veggies. I had enough sauce left over that I broke some spaghetti in half, cooked it up and then tossed it in the crock pot to soak up all the extra sauce and veggie goodness to serve as a side dish. Divide butter into 4-5 pats and place in the bottom of the crock pot. Slice bell pepper into strips then slice onion into strips the same size as peppers. It doesn't really matter how you slice them up, you just want them to be uniform in size. Season veggies with salt, pepper and garlic powder to taste. Add a layer of meatballs on top of the veggies. How many you use is up to you. Figure how many meatballs will fit into your hoagie rolls and multiply that by the number of subs you’re preparing. Or you can cook extra which is what I did because I knew I was going to cook some pasta and the leftover pasta and extra meatballs are going to be my lunch tomorrow :) Season meatballs also with salt, pepper and garlic to taste. Pour sauce over meatballs. Cover and cook on low for 8 hours or high for 4 hours or until veggies are tender and meatballs are heated through. Bake hoagie rolls at 350 degrees for 10 minutes. This step is optional but I like to do this so the outside gets good and crusty. 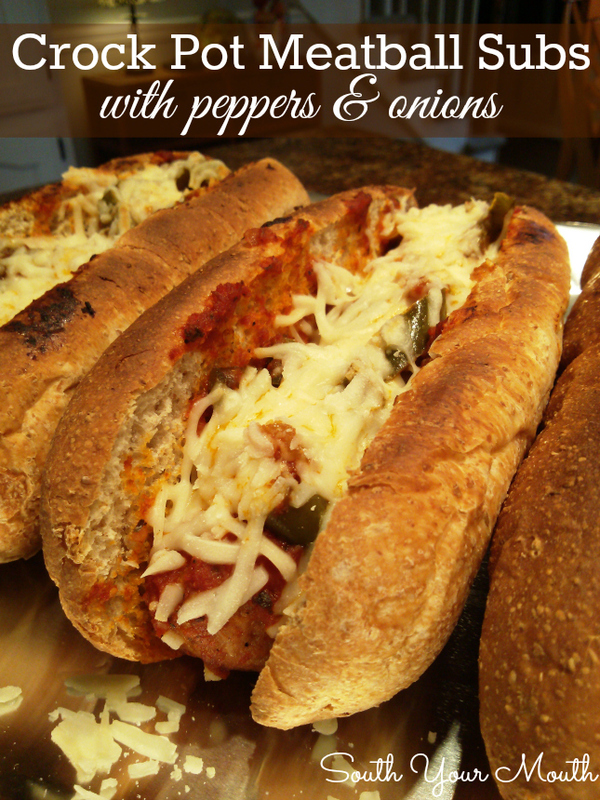 Slice hoagie rolls and fill with meatballs and veggies. Top with shredded mozzarella. Bake subs at 350 or broil on low until cheese is melted. *I say to use frozen because the meatballs are already cooked and if you’re going to cook this all day while you’re away from home, starting with frozen meatballs will help to slow down the cooking process so that your meatballs aren't overcooked. **I’m pretty insistent about shredding your own cheese but I fell victim to a great deal and bought the pre-shredded cheese. I was very disappointed that the cheese didn't melt like it would have had I used good cheese. As you can see in the picture, the cheese just didn't melt right. I broiled these until I was afraid the bread would burn then I covered them and baked them for a while and then I microwaved them for TWO WHOLE MINUTES and it still wouldn't melt right. Buy good cheese and shred it yourself. It’s worth it. And p.s. none of us has skin left on the roofs of our mouths now because these subs were like Dante's Inferno by the time I gave up trying to melt the cheese.